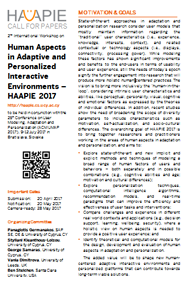 We sincerely thank all the participants for their contribution to the success of HAAPIE 2017. People differ in a various ways and change overtime, hence what are the challenges for user modelling at a basic (e.g., consistent formulation, what kind of data to use) and application level (e.g., how to obtain them (e.g. unobtrusive data collection), how to ensure reliability and how to interpret them)? How to decide which individual differences to use; what do we need to model (e.g. culture, disabilities, social, cognitive abilities/ load, personality, affect, etc.)? What is the role of (a) application/domain, (b) context, (c) technology (e.g. VR, Augmented reality, Game-based) in this process? Two sides of the coin; should we model and personalize triggered/based on the available data (RecSys – e.g. interaction logs) or user profiles (UM)? To what extent could those two viewpoints converge? How to use user characteristics and individual differences for the creation of effective adaptation and personalization mechanisms and algorithms? Does the utilization of more user characteristics lead to better (seamless) interactions? Do we make, this way, better interactive systems? People with disabilities present a rather dynamic user group that needs special attention and treatment; which factors to use, how to extract them and personalize? Is culture ready to be investigated (can we afford not to)? How strong is the association with people, impact, and what is the relevant gain? How do we comply with privacy and ethics? How to maintain transparency and control? How to ensure high quality of evaluations/mixed methods (e.g. avoiding quick and erroneous conclusions, biases, misleading interpretations, neglecting social implications)?